Very good sales of “Frostpunk”, “Moonlighter” and “This War of Mine” translated into record-high results reported by 11 bit studios S.A. for the first three quarters of 2018. In this period, the Company’s revenue was PLN 59.62m, which represented an over fivefold year-on-year increase, from PLN 11.4m. Operating profit was PLN 35.22m (PLN 2.35m), and net profit came in at PLN 28.52m (vs a PLN -0.56m loss a year ago). 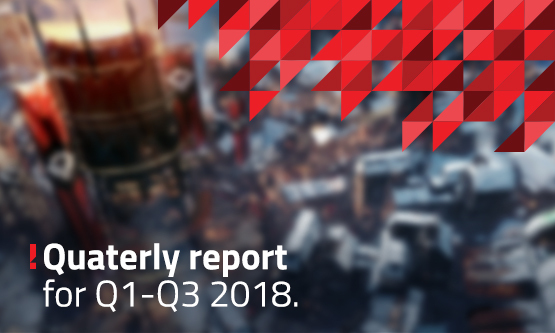 In the third quarter 2018 alone, the Company had PLN 13.89m in revenue (PLN 2.73m a year earlier). Operating profit was PLN 5.04m (PLN -0.67m operating loss in Q3 2017), with net profit of PLN 3.6m (PLN -0.83m net loss). “We are satisfied with the Company’s business achievements in 2018, both in terms of production and sales of our own games as well as development of the publishing division,” commented Grzegorz Miechowski, President of the Management Board of 11 bit studios S.A. Mr Miechowski pointed out that this year’s results take into account, among other things, high royalties paid to the producer of “Moonlighter” – a consequence of the game’s strong sales. “The royalties, which reached almost PLN 7m, translated into a major year-on-year increase in cost of services,” Mr Miechowski said. The growth in salaries and wages was attributable to non-cash provisions recognised for the Company’s 2017–2019 Incentive Scheme. “In the nine months to September 30th 2018, the provisions were nearly PLN 4.1m,” added the CEO. 11 bit studios S.A.’s sound financial condition is evidenced by the cash resources held. As at the end of September 2018, the Company had over PLN 61.67m in bank accounts, bank deposits, bonds and units of a conservative investment fund. This amount did not include trade receivables of PLN 4.54m, which are converted into cash on an ongoing basis. “Our cash and cash equivalents have already doubled since the beginning of the year,” Mr Miechowski emphasised. He believes that the very good financial condition does not mean that the Company will rest on its laurels. “On the contrary, it makes us work even harder,” he says and reminds that the most important task in the pipeline now is production of a game with a working title “Projekt 8” and an estimated budget of approximately PLN 20m. “We believe that “Projekt 8” will be the next milestone in our Company’s development. We also expect a successful release of our new game “Children of Morta,” planned for early 2019,” said Mr Miechowski. He announced that 11 bit studios S.A. would further develop “Frostpunk” and monetise “This War of Mine” and other titles, including “Moonlighter” and “Beat Cop”. “As our financial performance this year shows, diversification of revenue sources has a stabilising effect on the Company’s standing and is a key element of our strategy,” he sums up.